Two hundred years into the future, humanity has left Earth and colonized most of the solar system. The crew of the Jakob Waltz is returning from a routine ice harvesting mission when they suddenly discover they are off course. As they try to find out why they are not where they are supposed to be, they get caught in a gravity well near Neptune. A strange gravity pulse hits the ship, injuring several of the crew and damaging the ship. While the crew of the Jakob Waltz deals with this gravity anomaly, at Galileo Station near the moon, FleetCartel Chancellor Katryna Roja is dealing with her own problems. Tensions are rising among the members of the Executive Council and Chancellor Roja is fighting off the political maneuvers and machinations of other cartels. Katryna soon learns that there is significant rot within the well-run technocracy as she discovers that other cartel leaders are plotting against her. Seemingly disconnected, the problems facing both the crew of the Jakob Waltz and Chancellor Roja come into focus and each must struggle to understand what is happening as their separate worlds devolve into chaos. Legacy of Pandora is the first book in the Shan Takhu Legacy, a new trilogy by Eric Michael Craig. If you are familiar with Eric’s other novels – the Atlas in the Winds series – you know that he is a strong hard science fiction writer who puts a lot of real science into his stories. Legacy of Pandora is no exception even though it is set 200 years into our future. The science and technology are completely plausible and well-thought out, relying on real science and technology. On top of this add in two great story lines and you have an unbeatable combination. The Jakob Waltz story line focuses on the crew and their accidental discovery of a gravity anomaly at the Neptune L-4 Trojan Cluster. This has the feel of a well-thought out and well-written Star Trek episode. Chancellor Roja’s story line focuses on the politics of the Human Union – the well-run and effective technocracy that has kept humanity alive and thriving after the Earth became uninhabitable. This is filled with political intrigue, back-room deals, espionage, and power struggles. It is up there with the best of science fiction political dramas, like the newest Battlestar Galactica series, as Chancellor Roja must deal with the threats and accusations thrown at her as other members of the Executive Council try to gain control and power. Each of these story lines would make for a powerful and entertaining read on their own but Eric has blended them together to create a masterpiece of hard science fiction. I’m sure other readers will make comparisons with The Expanse series, but I think that Eric has added a unique element – the mystery of the anomaly the Jakob Waltz crew must investigate – that makes the Shan Takhu Legacy stand out. Eric weaves the politics and drama that are the focus of Chancellor Roja’s story with the mystery and adventure of the Jakob Waltz story into a seamless whole. I found the characters to be strong and compelling, and the plot well-thought out and complex enough to keep even the most well-read reader guessing until the very end. 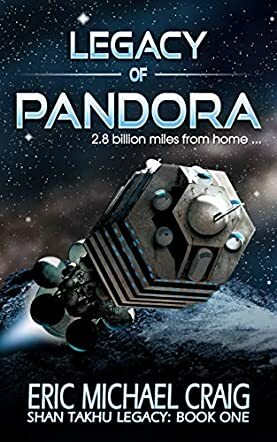 I highly recommend Legacy of Pandora for anybody who loves science fiction. Whether you enjoy the high stakes drama provided by political intrigue or the heart-pumping adventure of mystery and adventure, you will find both in this compelling novel.